I originally wrote System Message because I constantly needed to look up the message text corresopnding to an error value at a time when no such tool was widely available. However, the utility of System Message is fairly questionable today since Microsoft Visual Studio has been shipping with a similar tool called Error Lookup since quite some time. Moreover, the @err pseudo-register and the hr format specification in watch expressions of the IDE debugger provides the same functionality. System Message is nonetheless useful for system administrators who wish to decode error numbers and Windows developers that use another IDE than Microsoft Visual Studio. When you run the tool as a normal application, System Message displays a modeless dialog box as show in screenshot. 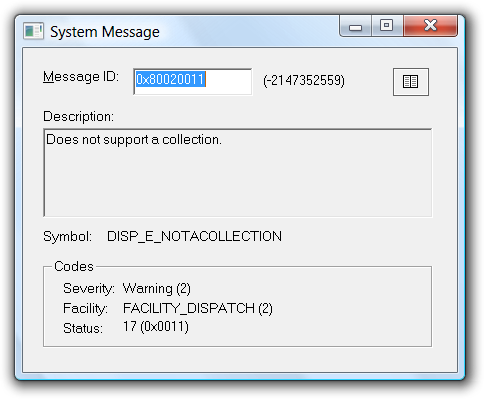 As soon as you start typing an ID in the text box, System Message attempts to fetch the corresponding message from the system. You can either entier the ID as a signed 32-bit or as an unsigned hex-decimal value. If the ID starts with the characters 0x, System Message treats the input as an unsigned 32-bit hex-decimal. Otherwise, by default, the input is always assumed to be a singed 32-bit value. If you press ENTER or ESC, System Message minimizes the dialog and remains on the TaskBar for further use. If you want quit the application, then click the close button on the window, or select Close from the system menu of the dialog box. Generated Thursday, April 25, 2019 10:13:23 PM (UTC).